"I'll wait here with the bears and the pumas." Rat Trap Gap in not what it sounds like. No rats. No traps. Not the hot, muggy, itching, bug-infested, claustrophobic thicket of prickly brush, stinging nettles, and sun stroke the name insinuates. Instead, a stately forest of Douglas fir, sugar pine, and a spattering of red fir and incense cedar presides over a broad, rolling open saddle that looks like a well-maintained park. Each tree keeps its distance from its neighbors with little or no underbrush. At 5900 feet, the trailhead is a lovely place to camp, complete with pit toilet and ample level spots to park a camper. We were going to the Yolla Bollys again. Why? Because, as usual, the high country to the north was closed by lingering snow pack and creeks swollen with snow melt. By telephone the rangers at Wildwood Station advised us that the road to Rat Trap Gap was open and the trail to North Yolla Bolly Lake was probably free of snow all the way. Probably. No one had actually been up that way. The better and shorter route to the trailhead, Forest Service Road 35, was closed because a tree was down between Stuart Gap and Rat Trap Gap. So instead, the ranger had recommended we drop down into the Sacramento Valley on Highway 20, then backtrack on FS Road 45, a rough, rocky, jarring 18-mile route that climbed a wasteland of dusty, scrub-covered foothills before entering the forest. We were compelled to rent a Dodge Grand Caravan because our full-sized Ford van had burned up a few weeks earlier (see Burning Van), but as it turned out, we were glad to be driving someone else's vehicle over the rocky roads. After surmounting the grassy knoll of Pattymocus Butte, the road entered a gradually thickening forest. The snow-mottled twin domes of North Yolla Bolly and Black Rock Peaks rose into view. We startled a rotund black bear daydreaming on the road. So frantic was it to escape our approach, its feet spit out puffs of dust and gravel as it fled. The beast quickly disappeared down the steep mountainside. When we arrived at the Rat Trap Gap campground, the wasteland of drab foothills far below was clad in a gray smog that cloaked the Sacramento Valley and obscured the Cascades rising on the other side. To limber up, we hiked a quarter mile further along the road that continues on to Tomhead lookout and found a clear stream tumbling down the hillside and passing through a culvert beneath the road. Barbara spotted a rare white-headed woodpecker. We heard and saw olive-sided flycatchers, a resident black-capped chickadee, and a chipping sparrow. After dinner we climbed a rough track from the campground that rose toward Rat Trap Ridge and offered a splendid view of Tomhead and snowy North Yolla Bolly Peak. That night we slept on our backpacking air mattresses in the back of the mini-van. 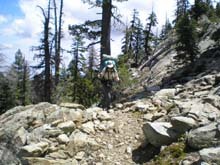 Saturday morning beneath patchy clouds we loaded our backpacks and began climbing the Yolla Bolly Lake Trail. Twice before we had camped at North Yolla Bolly Lake, most recently in June of 2000, but had accessed it from Pettijohn Meadow at the west end of this same trail. This time our route from the east would ascend approximately a thousand feet and drop five hundred in a little over three miles, a perfect warmup for our first backpack of the season. Our trail began climbing a forested knoll in tall mixed conifer forest in the Trinity National Forest, then contouring along the north slope of the ridge that rose westward toward North Yolla Bolly Peak. According to the map, we would not enter the wilderness until we had hiked the first two miles. Our route crossed three more streams, each more swollen with Spring runnoff than the last. The first two I forded in my hiking boots and managed to rock-hop and splash across without shipping any water. Barbara's knee was unstable from an injury suffered during the van fire, so she took the precaution of wading across in her water shoes. We had still not reached the wilderness boundary when the roar of a mighty cascade began to swell. We emerged from the undulating forest slopes at a seam of rock that ascended toward the east face of the abrupt greenschist massif of North Yolla Bolly Peak. Down the canyon of water-smoothed bedrock crashed a frightening torrent of whitewater. The trail seemed to lead dead ahead into a blind tangle of willows surrounding the cascade. I clawed through the brush and branches to the creek's edge. A crossing there would be chaotic and perilous. One misstep on the slippery rock might result in a tumble into the pounding cascade, serious injury, and maybe death. Up and down the jumble of boulders I scrabbled, looking for the trail to emerge on the opposite bank, but found no crossing safe enough to risk our lives on. Stymied, I rejoined Barbara on the rocky ledge overlooking the creek, where we surveyed the terrain and pondered the real possibility of having to retreat to the car like whipped puppies. 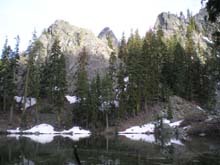 The ledge offered a fine view across a forested valley to the next ridge north. A well-made fire ring had been built on the horizontal rock face. The place would provide a fine consolation campsite (N 40 12' 01", W 122 57' 24"). But on the far side of the impassible creek, high on the forbidden sidewall of the canyon, our trail appeared to continue along a wide contour of slickrock ledge rising northward along an exposed flank of the mountain. "How the hell are we supposed to get over there?" I wanted to know. I do not remember who saw the switchback first. Mesmerized by the cacophony of thundering water, we had overlooked a sharp dogleg where a path cut back beneath the outreaching branches of a grove of moss-clad maples and, hidden by their broad leaves, zig-zagged steeply up the rocky defile. Perhaps that was the main trail. Leaving my backpack with Barbara, I climbed up to investigate. A hundred feet above, the path veered right to a flat, gravel-bottomed stream-crossing, no more than calf-deep. On the far bank, a well-defined trail continued onward. Upstream, surging around the corpse of a great fallen log, an awesome waterfall thundered. Below lay the dangerously tumbling turmoil I had been seeking to avoid. We lugged our backpacks up the slope. Barbara looked the crossing over, then began unlacing her boots. "I think I can do it." 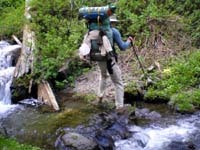 The carrying power of moving water is directly proportional to the cube of its velocity, so even a knee-deep stream can be powerful and treacherous. With our hip belts unclasped so we could wriggle free of our backpacks should we be washed over the rock lip into the pounding rapids below, with our hiking boots dangling from our necks like pendulous buckets of ballast, we poked and probed with our walking sticks at the migrating gravel bottom as we inched our way through the swift, icy current. Once safely across, we dried our toes on the shanks of our wool socks and hung our dripping water shoes from our backpacks. The creek crossing should have marked the boundary into the wilderness. There we left behind the gentle path meandering through forest and meadow and began to ascend a track scratched into the bedrock face high above the descending canyon. The trail climbed steeply up the exposed mountainside before dipping into a high forested valley of giant rounded boulders, pried loose long ago from the altered mafic cliffs and spires of the glaciated north face of North Yolla Bolly Mountain. Among these fallen metamorphic monoliths, some as huge as small houses, the trail wound up the alpine valley as through a modern sculpture gallery. Immediately we came to the trunk of a massive tree fallen squarely across the trail. The five-foot barrier lay just beyond a sign marking the wilderness boundary, as if intentionally placed there by the giants inhabiting this valley. A rough track had been bushwhacked by previous travelers around one end of the log, and along it we waded through branches and brush until we could return to the trail on the other side. Smaller logs had also fallen across our path, but they were more easily crossed. Trail crews had apparently not ventured into this corner of the wilderness for a long time. Glistening through the trees we soon beheld our final obstacle. The head of the valley lay buried beneath brilliant white snowdrifts. 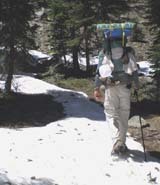 Leaving my backpack with Barbara, I ventured across the snow to see if I could find where the trail emerged above. The crust had thawed and refrozen into a glaze that supported my weight. There were no footprints to follow, but I kept watch along each side of the drifts lest the trail concealed beneath might veer away from the line of the valley floor. In time I arrived at the headwall of the valley, where the trail emerged to climb the slope angling north. "I found the trail," I radioed Barbara, "but I'm going to follow it on up to the lake to see if there's any more snow we can't get around. Can't be more than a half mile." "All right." She responded. "I'll wait here with the bears and the pumas. Take your time." The trail climbed to a ridge crest, then circled back into a dark, north-facing canyon where it continued to ascend toward another crest. I could hear water tumbling somewhere across the canyon. Near the top were more patches of snow that reached down like dying fingers to cross the trail, but even on the steep slope I detoured around them without much difficulty. A week ago, this route was probably impassable without crampons. At the final crest I found myself standing at the outlet of the lake. Water swirled through an easy rock crossing before cascading down into the valley. 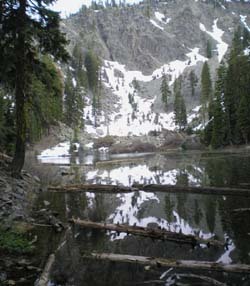 Snow lingered on the shady north face of North Yolla Bolly Peak, which rose abruptly above the water, but the more gentle lower slopes that embraced the lake were free of snow. We would have no trouble finding a campsite. We lugged our heavy backpacks up the trail that seemed to have grown steeper. The snow portages no longer seemed quite so easy. On the moraine above the outlet stream, where we had seen others camping years before, we searched for a campsite, but among the rocks and brush found nothing smooth and level enough to suit our tastes. 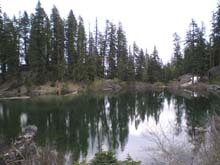 So we continued on the trail around the small lake to our old campsite in a tall mixed-conifer grove on the west shore of the lake, where someone had cut and filled a narrow tent site into the bank between the trail and the water (N 40 12' 17.5", W 122 58' 05"). The lake was beautiful and quiet. It felt intimate, stark, and pristine, really too small for more than one group of campers at a time. Fortunately, we were alone, perhaps the first visitors of the season. To the south, above a treeless pitch of snow fields and tumbled boulders, towered a sheer bedrock rock shoulder of North Yolla Bolly Peak. Across the reflecting water to the southwest loomed three naked spires, cleavers of greenstone that rose like the mother of all stone deities, perhaps conjured here from Machu Picchu or levitated from Easter Island. 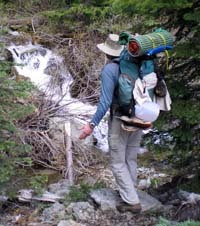 Behind us on the steep, forested, western slope of the cirque, the trail switch-backed up through dense forest toward a bright rocky outcropping high above, whence it would begin its long descent through nodding Brewer spruce, fir, and pine to the headwaters of the South Fork of the Trinity River at Pettijohn Meadow. We set up our tent and I converted the large stone campfire ring to accommodate our small grill. Then we explored the area, remembering some features and discovering many more as if for the first time. Six years had passed since we last camped there. Across the placid water snow banks reached down to the water, so we did not consider a dip. I spread the extra tarp over the pile of firewood we collected, just in case the passing clouds might defy the weatherman and produce rain overnight. As twilight fell it grew cool, so we retired into the tent early. Sunday morning was crisp. Wisps of mist rose from the water. The sun was slow to rise above the walls of the cirque. At first the weather looked good, and we lounged around camp drinking tea and mocha and eating a leisurely breakfast. Then clouds began drifting in from the west bearing the smell and feel of rain. The weather radio assured us of only a "slight chance of afternoon thunderstorms," but we knew the report was meant for the valley dwellers far below, huddled together like warm, dry sheep. Like magnets, the high peaks drew in rain clouds, shredded them on razor-sharp spires, and wrung out their moisture. And we were camped among the highest. We decided to hike out. A single night on the ground was short, but better than enduring a cold, wet, and miserable second one. The snow drifts in the valley of giant boulders and first frightful water crossing had, with familiarity, lost some of their menace. We carefully recrossed them both. On the forest trail beyond the cascade, hail began to pummel us, and the temperature plummeted. Our breath came out in white puffs. Then came drenching rain. We stopped to help each other drape rain ponchos over ourselves and our backpacks. Our fingers grew numb on our trekking poles. The last two creeks we splashed across without changing shoes. We did stop, however, to pluck that last large morel from the duff, and even spent a few minutes in the rain looking for more. Rat Trap Gap campground glistened in the chilly air. Long, vertical threads of drizzle hung from the bruised sky like a valance, but in the distance far below, the Sacramento Valley glowed in full sunshine. There was no shelter there for us, so we quickly piled our wet gear into the minivan and headed down the rough forest road toward the light. When we had dropped below the precipitation, we glanced back to see fog and black clouds descending over North Yolla Bolly Peak. Somewhere up there it was probably snowing.